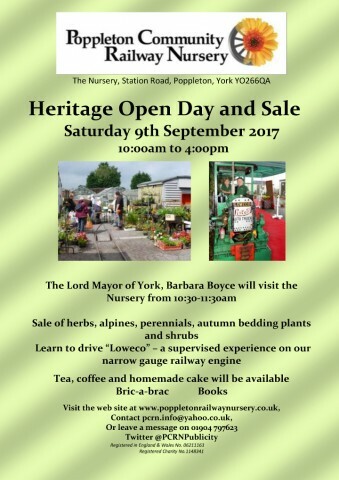 Poppleton Community Railway Nursery is holding a Heritage Open Day and Sale on Saturday 9th September 2017 from 10am-4pm. There will be an opportunity to book a slot to learn to drive our narrow gauge railway engine under supervision. The Lord Mayor of York will make a morning visit. Herbs, alpines, perennials, autumn bedding plants and shrubs will be on sale. Tea, coffee and home made cake will be available.